16 oz. Clear Mixing Glass. 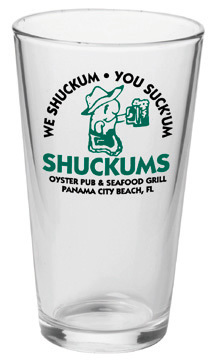 This clear pub glass is a bestseller of beer glasses, suitable for any promotion and client. Perfect for restaurants, cocktail lounges and bars. Its large imprint area provides ample room for that power message. The mixing glass is generously sized, with plenty of room for beer or any other choice beverage. It is perfect for any party or event. It's a keeper for anyone who takes the imprinted glass home. --our mixing glasses come in many different styles and sizes including our sports pub collection. --comes in blue, frosted as well as clear. • Imprint area: 4" H x 3" W x 8-5/8" Wrap.